every oat has its day (a well-known scottish saying that i just made up). every morning, for my breakfast i have a plate of porage oats, usually decorated with either sliced banana, peach or nectarine. it's how the other half live, you know, even if i pinched the idea from bob's red mill in portland. during the six nations rugby prior to the summer and tour de france, scott's of porage oats fame proffered boxes on which the kilted shot putter had been replaced by scottish rugby players (not that it did them any good). the contents were not of standard fare, but instead, massive big oats that dwarfed their siblings by some margin. now that the rugby has gone, so have the rugby fronted packets, and we're back to the more normal size. not a lot of difference in taste, but more manageable in the bowl. lexicographer, samuel johnson famously wrote of oats, when compiling a dictionary of the english language 'it is a grain which in england, is generally given to horses, but in scotland supports the people.'. it warms the heart no end to discover that the scots had an appropriate riposte; 'england is well known for the quality of its horses, and scotland for its men.'. damn well said. and in order to uphold this national heritage, i have taken it upon myself to fill at least one of those back pockets with one of clif's new choc chip bars. now i should make it perfectly clear at this point, should some of you be taking notes and checking them regularly, that anything with chocolate chip in its name would normally be persona non grata. i have no great love of chocolate, and would normally decry its chips as the spawn of the devil. but combinations and circumstances can oft times cause one to renege on previous dogma and diktats, and i am confused to say that such has been the case here. had the options been presented to me far enough in advance, i would perhaps have plumped for the crunchy peanut butter, or, perchance, the oatmeal raisin walnut, in which case at this point in my diatribe i would be extolling the great virtues of either of the foregoing with a grin on my face. and what am i doing instead? 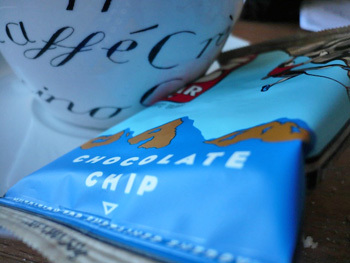 well, actually, i'm extolling the virtues of the choc chip clif bar with a grin on my face. last saturday, in the newly realised cold weather, trying desperately to keep up with my colnago master, i had occasion to stop briefly at saligo bay overlooking the atlantic coast, for a bite to eat. carbo loading you understand, for us oat-fed scots would never ever stop merely as a result of tired limbs. boy was that welcome munch. 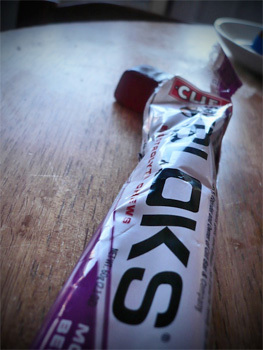 at that point in a hard ride (all relative you understand), a mouthful of oats was graciously tempered by the smattering of chocolate chips, tasting unlike almost every other energy bar sent my way. if i'm as honest as you hope i might be, you could easily chomp on one (or two) of these along with a cappuccino, perilously nowhere near a bicycle. the following day, with my generosity knowing no bounds, i handed one to the mighty dave-t in order that he might savour the same sustenance. thus the choc chip clif bar received the mighty dave's seal of approval, and let me assure you that those are not handed out willy-nilly. containing a total of 240 calories per bar, a 68g snack contains a mere 5g of fat, and a generous 10g of protein. there's a whole host of clif stuff available if your aversion to choc chip is greater than mine was, and one of their completely oat-free offerings was contained within the same package as the oat bars. this is a squirmy gelatinous texture inside a plastic wrap, which was, quite frankly, a bit scary. the idea behind it is perfectly sound; bars and carbo drinks satiate the calorific requirements of the hardened scot (apparently just as applicable to other nationalities too), yet while this hardening and atlantic proximity tends to restrict any propensity to become swot and hetty, there is a need occasionally to replace salts and minerals, along with a carb or two which is sort of where isotonics come in. 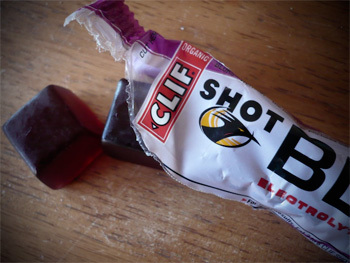 these are normally ingested by way of perhaps that second bottle on the seat-tube, but clif have devised an alternative: jelly cubes. for yes, that lengthy jelly stuff is separated into little squares inside the pack, easily assimilated by the chewing cyclist. who knew? mountain berry is joined by several other yummy flavours and it's a snip (if you'll pardon the pun) to open the top of the pack before the off, stick it in a back pocket, and throw a square into the lion's den as you ride. highly pleasant, if truth be told. 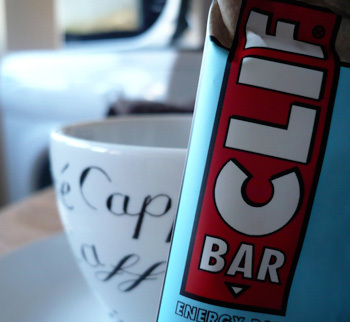 clif products are distributed in the uk by 2pure, but i'd have a look at the clif website to see just what a plethora of on-the-bike nutrition is available after you've had your porage in the morning. and it's porage, not porridge. just saying.